3x1 "Eden" shorts in heavily distressed denim. Approx. 4" inseam. Five-pocket style. High waist. Raw hem. Front zip. Cotton. Machine wash. Made in USA of imported material. A.L.C. "Issac" shorts featuring two rows of decorative buttons. Slant pockets; back welt pockets. High waist sits at navel. Flared, trouser-cut legs. Viscose/spandex. Unlined. Imported. 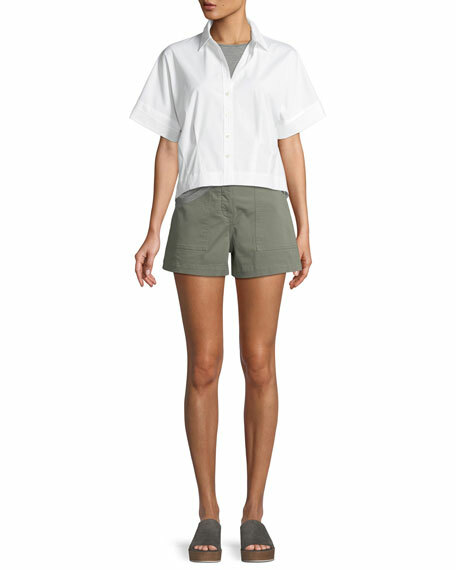 Alice + Olivia "Donald" woven crepe shorts. Approx. measurements: 3" inseam; 12" front rise; 16.2" back rise. High-waist; flat front. Side button trim. Side patch pockets. Back besom pockets. Slim fit. Polyester/viscose/polyurethane. Lining, cupro. Imported. Cinq Sept "Tobie" denim shorts with contrast topstitching. Mid-rise; snap tab & zip fly. Coin pocket zip. Slim fit. Mini length. Cotton/polyester/spandex. Imported.